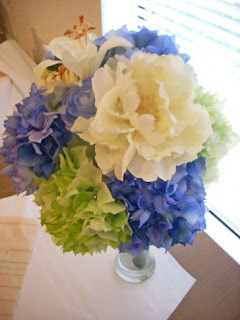 This was my favorite wedding project - making my own bouquets! I used "silk" flowers from Michaels. I figured I probably couldn't get the blue color I wanted from real flowers! Since they aren't real flowers I was able to make them all myself, months ahead of my wedding date. I was also spared the hassle of dealing with delicate flowers and finding a way to store and transport them. These bouquets could easily be tossed in a plastic bag without suffering. 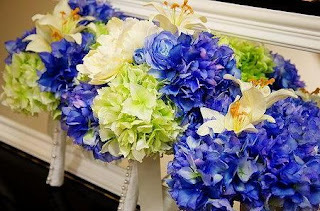 After placing all of the stems together the way I wanted the bouquet to look, I wrapped them together with masking tape and then hide the tape with green floral tape. 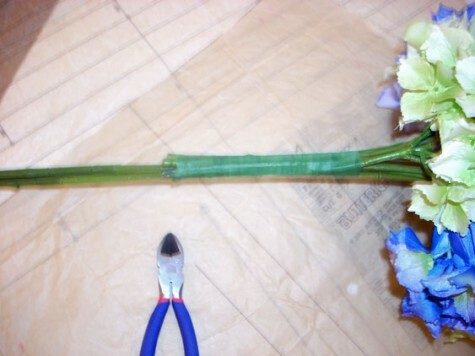 Then I cut the stems with a wire cutter (this was the difficult, time-consuming part!). Once all of the bouquets were made I created silk wraps with pearl buttons to disguise the wire stems. I love how they turned out! Two anniversaries later, my bouquet still looks gorgeous in a vase in my kitchen!